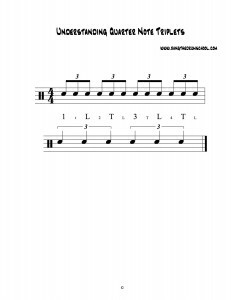 Reading and playing quarter note triplets is a topic that comes up frequently with beginning drum students. In order to understand how to read, count and play quarter note triplets, you first have to understand how eighth note triplets work, which is fairly easy. The worksheet abbreviates the words “One-Trip-Let” as “1 T L,” and you can see how the counting lines up with the both the eighth note triplets (top measure), and the quarter note triplets (bottom measure). The quarter note triplets, shown on the second measure, line up with every other eighth note triplet, because that is how they are derived. Quite simply, quarter note triplets are exactly one half of eighth note triplets, and by omitting every other eighth note subdivision across two eighth note triplets, the result will be one single quarter note triplet. Hopefully, the graphic of the worksheet will allow you to understand how it works. omitting the “let” that follows “two. This sounds complex, but looking at the graphics on the worksheet should make it clear…note how the quarter note triplets line up visually with the eighth note triplets and you should have a good sense of how this works. I hope this is helpful…..as always, questions and comments are welcome. Very useful, Mark. Many thanks for the post. Hi Biju! You’re welcome. Glad it was helpful. Hi Giselle- You’re welcome. Glad the post was helpful.